Summer can be really taxing, especially in places like India. That is when nature's precious gifts come to our rescue. Coconut and watermelon are really a boon during such times. 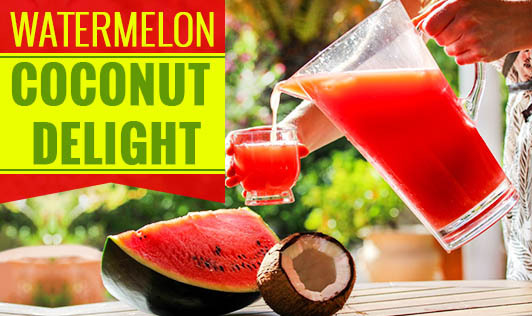 Coconut is filled with electrolytes and watermelon is naturally sweet. This drink combines both these awesome fruits to make a refreshing drink, which is nourishing and healthy for you and your family. • Put all the ingredients into the blender, except mint, and grind it. • Strain the puree to remove any seeds. (Even if you get a "seedless" watermelon, some small vestigal white seeds may still be present). • Muddle mint with a sprinkle of sugar in two glasses. • Fill each glass with ice. Note: If needed, you can adjust the ingredients to make a blend that suits your taste.